Yachting Casino is no longer available . Click here for alternative casinos . 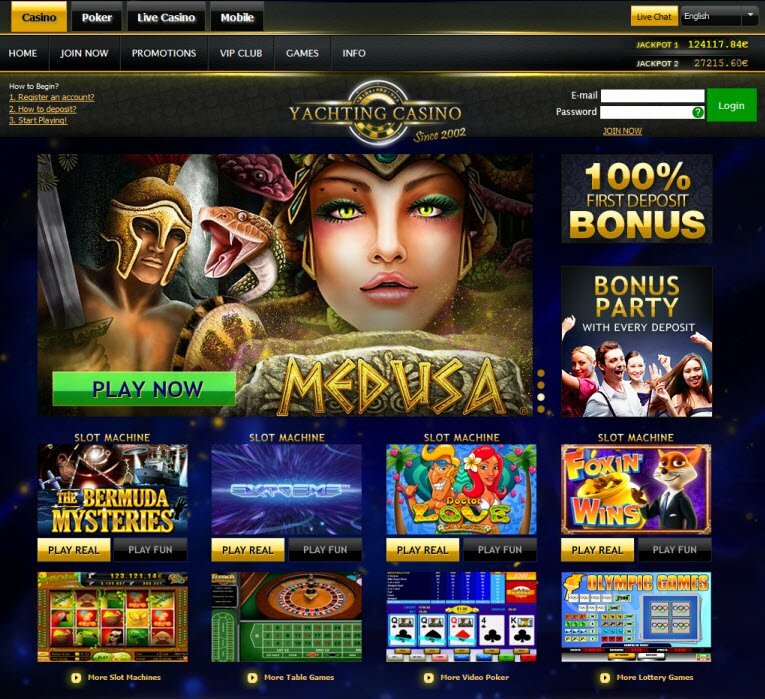 With themes such as Bangkok Nights, Wonder Woman, Ibiza, Mafia Boss, and Dracula, Yachting Casino offers a wide variety to satisfy any online gamer. Play Yachting Casino for a decent online casino experience without the need to download software onto your computer. Since 2002, Yachting Casino has provided an array of slot machines, video poker, lottery games, and table games including different versions of blackjack and roulette. Although the casino does sometimes give the impression as a cheap imitation of other, better quality online casinos, Yachting Casino does offer the convenience of playing without registering or downloading software to the computer. Yachting Casino features an easy log-in, online flash casino so you won’t need to download any files onto your computer. Since it’s a real-time flash casino, users may experience problems with the games loading very slowly as I often experienced run-time errors. 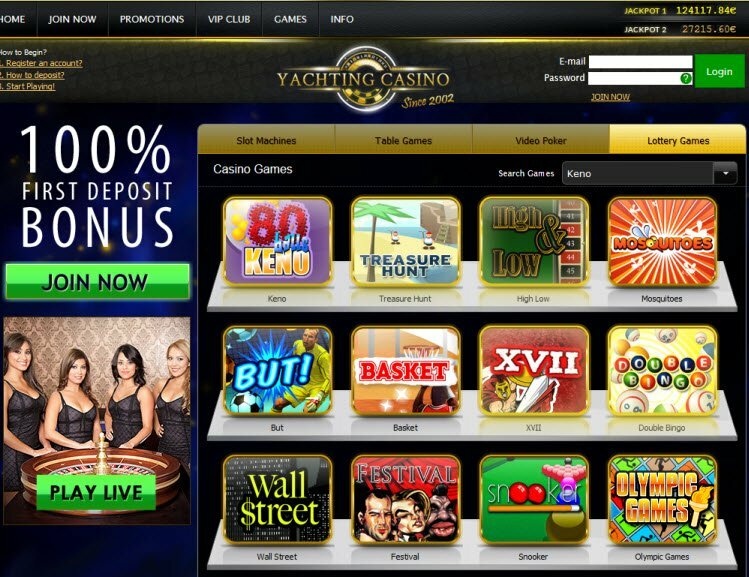 Yachting Casino offers slot machines, table games, video poker, and lottery games. To play Yachting Casino games, your computer requires Flash Player 9 software which can be downloaded for free from the Adobe site. Their website warns that users connecting with Netscape Communicator and Macintosh owners may have trouble playing the software. Gamers can play Yachting Casino for free on demo mode, whether a registered player or not. In demo mode, players have 1000 credits to test the games. However, I found it difficult to navigate to where I could try a demo without registering. It seems they either require registration or carefully hide the option to play without signing up. Open the Bermuda Mysteries video slot game, and you will hear intense music play with sounds of an eerie submarine sonar echoing in the background. Although the game involves elementary graphics such as life jackets, cruise ships, radios, and stylized letters and numbers, the mysterious ambiance of the game does give it some level of appeal. Yachting Casino offers an impressive and well-designed 3D video slot game called Piggy Bank. Think Ocean’s 11 meets Charlotte’s Web - the game involves bank robbers wearing pig masks, dressed in suits, robbing a bank. The cool background music seems reminiscent of a 1970’s bank heist movie or something sleek and classy out of James Bond. Frankly, I was really impressed with the quality of the graphics especially for an online flash casino. The game comes complete with a feature bonus game, multiplier bonus, wild symbols, Click Me Bonuses, and cool images of bank robbers in masks. Piggy Bank also features the debut of a new Floating Multiplier Bonus feature, which is an innovative bonus that awards players with special multiplier bonuses on select reels and winning combinations. Yachting Casino offers an impressive and well-designed 3D video slot game called Piggy Bank. Think Ocean’s 11 meets Charlotte’s Web - the game involves bank robbers wearing pig masks, dressed in suits, robbing a bank. From Bonus Parties to VIP Thursday, Yachting Casino Bonus promotions will surely please anyone looking for a great online gaming experience. One such example includes a Superman vs. Wonder Woman battle of the slots in which players choose their side and place bets to win. In addition, Yachting Casino’s VIP Club offers rewards for loyal members based on a point system. The VIP Club has five levels providing more benefits the points as they accumulate from playing. 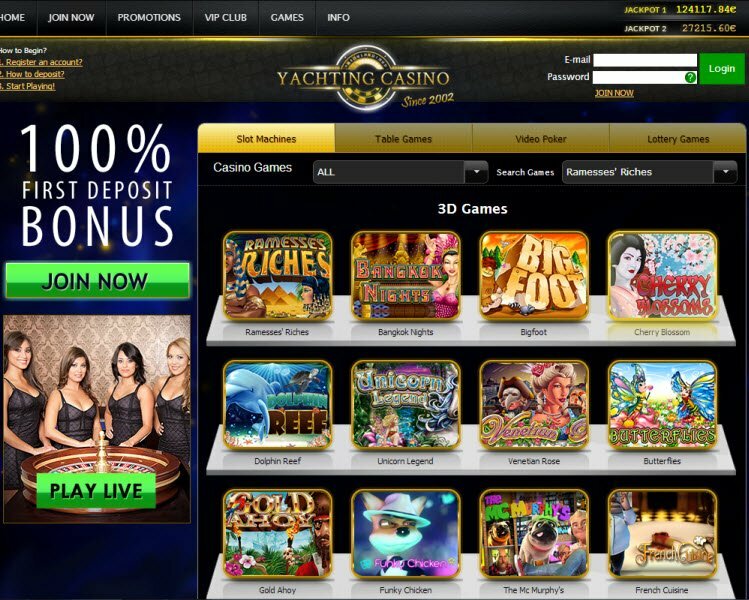 Yachting Casino accepts many different payment options, and players can choose which method suits them best. Acceptable payment methods include Visa/Mastercard, Visa Electron, Maestro International, Carte Bleue, Ticket Premium, Neteller, Skrill, and bank wires. Players can view transaction history and withdraw funds directly from the Yachting Casino webpage. Yachting Casino provides superb customer support. When I requested online support through the casino Live Chat messenger, a customer service representative immediately attended to all of my questions and concerns. The Game Of Thrones Slot is my new favorite! And even better, my favorite casino (Yachting casino of course) is having a spectacular promotion on this slot until December 8th. I know what Im doing this weekend!